This week for Take a Stitch Tuesday 2019 the stitch is Butterfly chain. I always feel this stitch is a much under-utilised decorative composite stitch. Once you start playing with it, I am sure you will realise how versatile it can be and how much fun it is to do. Don’t forget to check out the tutorial on how to work Butterfly chain stitch for instructions on how to do it and to give ideas on how you might adapt and use it. This week I am going to suggest that for those who are doing the beyond TAST challenge they try out Spanish Feather stitch. It can be a bit tricky but then Beyond TAST is supposed to be for those who are intermediate stitchers or those people who have done TAST in previous years. It is sort of stitchers level 2! With that in mid I challenge you to try something a little trickier! Also I would like to wish all my readers a healthy safe and happy Easter. No matter your faith or beliefs my heart felt good wishes reach out to all my readers. Stitch a sample, photograph it, put in online on your blog, or share it in the Take a Stitch Tuesday Flickr group, or in the TAST facebook group or where ever you hang out online. Hashtags are #TASTembroidery and #PintangleTAST on places like Instagram etc. If you have a blog leave a comment on the stitch page In other words either Don’t forget your full web address, including the the HTTP part of the web address so that it becomes a live link. It means people can visit your site and see what you have done. Experimenting with different threads can be expensive, as you would normally have to buy a whole skein of each type of thread. So I have made up my thread twisties which are a combination of different threads to use in creative hand embroidery. These enable you to try out stitching with something other than stranded cotton. For the price of just a few skeins, you can experiment with a bundle of threads of luscious colours and many different textures. These are creative embroiders threads. With them, I hope to encourage you to experiment. 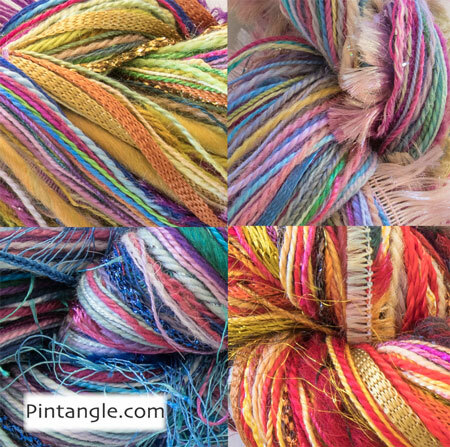 Each Twistie is a thread bundle containing silk, cotton, rayon and wool. Threads range from extra fine (the same thickness as 1 strand of embroidery floss) to chunky couchable textured yarns. All threads have a soft and manageable drape so that twisting them around a needle makes experimental hand embroidery an interesting journey rather than a battle. Many are hand dyed by me. All are threads I use. You may find a similar thread twist but no two are identical. You will find my thread twisties in the Pintangle shop here. I love all the variety of the colors of the threads. I do agree it cost I am on a limited income right now that should be changing soon. I enjoy it very much.